Springtime in the Lake City, Iowa, area brings warmer weather, green grass and Lenten Luncheons, a popular tradition that has endured prior to Easter for 45 years. While some elements of the luncheons have changed through the decades, one thing remains the same—the delicious recipes. 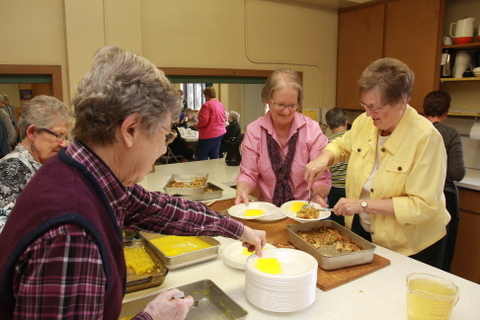 “We’ve used these recipes for years,” said Marylyn Gillespie of Lake City, who makes her famous Potato Buns when the Pilgrim Lutheran Church hosts the Lenten Luncheon. 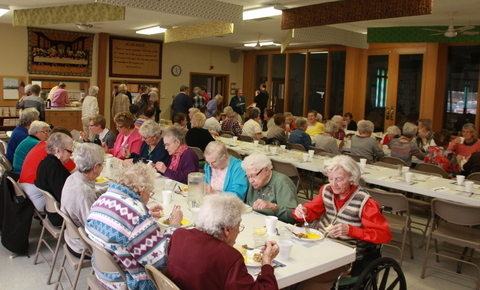 Lenten Luncheons involve a variety of churches in Lake City (including Pilgrim Lutheran Church, the Lake City Union Church, St. Mary’s Catholic Church, the Woodlawn Christian Church and Baptist Church) along with the United Methodist Church in Lanesboro. During Lent, each church takes a turn hosting a noon luncheon, starting with devotions and concluding with a home-cooked meal, complete with a casserole, salad, rolls and beverages. When Lenten Luncheons were first proposed in the early 1970s, the idea met with some skepticism. Local church women gradually warmed up to the concept, however. Minutes from the ladies’ business meeting on Feb. 10, 1971, noted that six local churches (including churches from Auburn) would participate. Each luncheon would be held on Monday and would include a menu featuring a casserole, salad, rolls, coffee and tea, with no dessert. “We still use many of the recipes they did in 1971,” Gillespie said. 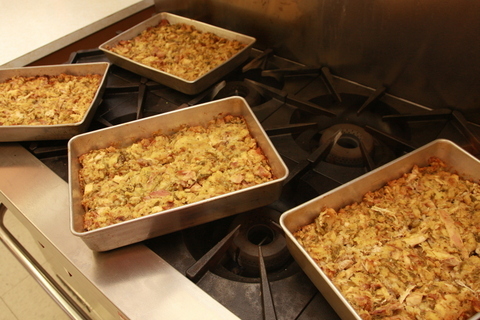 This simple, tasty casserole comes from the United Methodist Church in Lanesboro. Mix all ingredients in order given. Place in greased 9-inch by 13-inch pan. Cover and refrigerate overnight. Bake uncovered for 1 hour at 350 degrees. This recipe comes from the Lake City Union Church. Stew chicken (adding celery, onion, salt and pepper, to taste), and cook until chicken is done. Cube the meat and mix with cream of chicken soup, sour cream, peas and pimentos. Put mixture in greased 9-inch by 13-inch pan. In a bowl combine stuffing mix, butter and chicken broth. Place mixture on top of chicken casserole. Bake at 350 degrees for 45 to 60 minutes. The ladies of the Pilgrim Lutheran Church in Lake City serve this refreshing, simple salad with Chicken Casserole when they host the Lenten Luncheon. Dissolve gelatin in hot water. Add cold water and fruit. Pour into 9-inch by 13-inch pan, and chill. Let salad set up well before cutting. 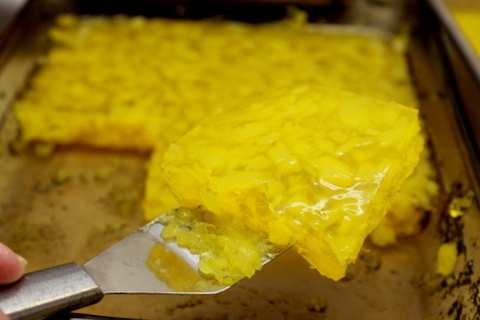 Combine pineapple with juice and sugar in a saucepan. Bring to a boil, and boil for 3 minutes. Add gelatin, and stir until dissolved. Add cream cheese to warm mixture. Allow mixture to cool before adding nuts, apples, celery and whipped topping. Pour into a 9-inch by 13-inch pan. Chill. Serves 10-12. These tasty dinner rolls are a specialty of Marylyn Gillespie, a long-time member of Pilgrim Lutheran Church in Lake City. Peel and cube approximately 2 to 3 medium potatoes. Boil potatoes. Drain and reserve potato water. Mash the potatoes. Soften yeast in 1 1 / 2 cups hot water. In a separate bowl, combine margarine, shortening, granulated sugar and mashed potatoes well with a mixer on medium-high speed. Add the softened yeast. Let mixture stand for 2 hours at room temperature. Set pans on kitchen counter. Cover rolls with a towel; let dough rise. This will take two to four hours, depending on the warmth of the day and the warmth of the kitchen. Test the rolls by seeing how much they have raised, and tap lightly on one or two rolls to see how they feel. Bake buns at 350 degrees. Avoid baking at 375 degrees or higher, since the buns tend to get too brown on top. Bake 30 minutes, or until you can “bounce” them in the pan. Then “bounce” the buns onto racks. (Marylyn “bounces” the buns onto racks that she sets on top of the baking pans, so the buns can cool from the bottom as well as the top, which avoids a “soggy bottom.”) Let buns cool completely. Recipe makes approximately 7 dozen dinner rolls, or 5 dozen sandwich buns.